A new species of puddle frog (female Phrynobatrachus bibita sp. nov.) from an unexplored mountain in southwestern Ethiopia. Credit: NYU Abu Dhabi researchers S. Goutte and J. Reyes-Velasco. In summer 2018, NYU Abu Dhabi Postdoctoral Associates Sandra Goutte and Jacobo Reyes-Velasco explored an isolated mountain in southwestern Ethiopia where some of the last primary forest of the country remains. Bibita Mountain was under the radars of the team for several years due to its isolation and because no other zoologist had ever explored it before. "Untouched, isolated, and unexplored: it had all the elements to spike our interest," says Dr. Reyes-Velasco, who initiated the exploration of the mountain. "We tried to reach Bibita in a previous expedition in 2016 without success. Last summer, we used a different route that brought us to higher elevation," he added. 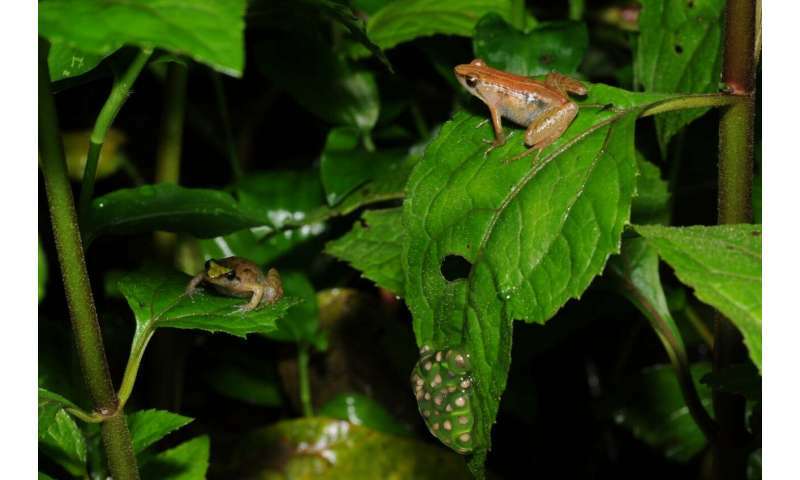 Their paper, published in ZooKeys journal, reports that the new, tiny frog, 17 mm for males and 20 mm for females, is unique among Ethiopian puddle frogs. 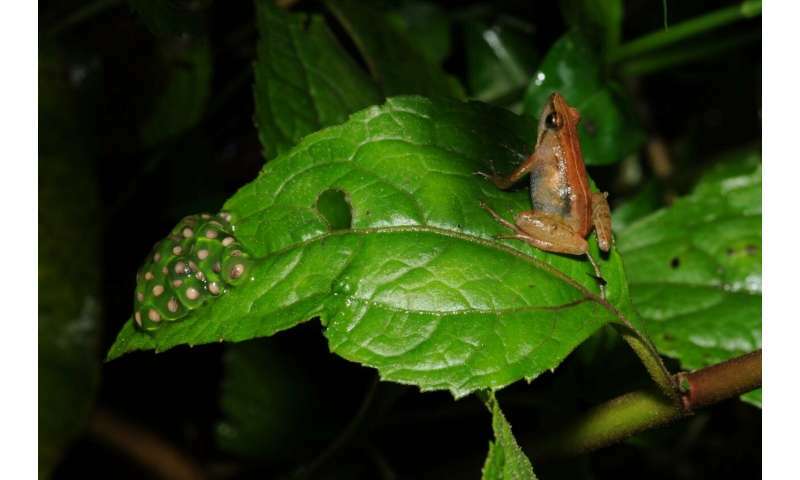 Among other morphological features, a slender body with long legs, elongated fingers and toes, and a golden coloration, set this frog apart from its closest relatives. "When we looked at the frogs, it was obvious that we had found a new species, they look so different from any Ethiopian species we had ever seen before!" explains Dr. Goutte. "The discovery of such a genetically distinct species in only a couple of days in this mountain is the perfect demonstration of how important it is to assess the biodiversity of this type of places. The Bibita Mountain probably has many more unknown species that await our discovery; it is essential for biologists to discover them in order to protect them and their habitat properly," explains NYU Abu Dhabi Program Head of Biology and the paper's lead researcher Stéphane Boissinot, who has been working on Ethiopian frogs since 2010.